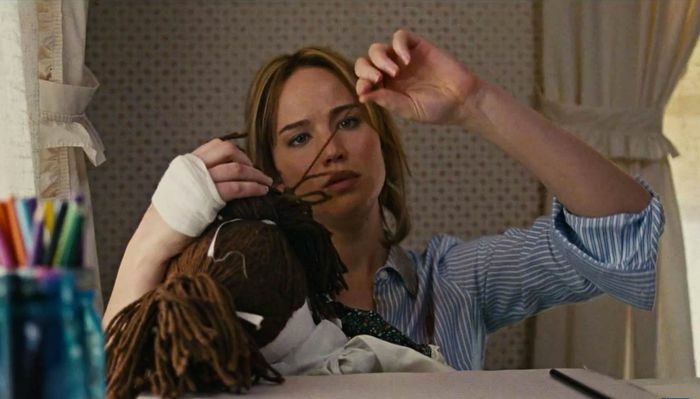 Through most of David O. Russell’s latest film, Joy Mangano is a hot mess. So too is the movie recounting her admittedly impressive story. O. Russell’s mop drama, which tells of the meteoric rise of an enterprising, low-income single mom, reprises the director’s almost voyeuristic fascination with lower-class dysfunctional families. This narrative thread was accomplished to great effect with The Fighter and Silver Linings Playbook (don’t forget the wide-eyed Tiffany lived in a makeshift hodunk studio in the later) and, if Joy is any indication, this recurring thematic motif has run itself dry as menopause with O. Russell. The once-great director, known for culling Academy Award worthy performances one after another, is left floundering with little but the awesome starring power of Jennifer Lawrence to revive this spark-less, cluttered trainwreck of soapy family melodrama. O. Russell, who gets exclusive screenwriting and story credit, starts the film on an odd note – within the actual confines of a soap opera. That is, the few minutes are spent on the set of a soap opera that one of Joy‘s characters is often seen watching later in the film. At first glance, it catches one off-guard, offers a few laughs and makes the case that Joy might be a truly one-of-a-kind yarn. That is not the case. One might recall how Darren Aronofsky used a game show (“Juice by Tappy! Juice by Tappy! Goooo Tappy!” – that chant that’s forever ingrained in our skulls) to illuminate the crumbling mental state of Ellyn Burstyn to haunting effect but O. Russell’s usage of the soap stage is strange and haphazard and indicative of all the problems to come. Where there should to be something poignant to his meta commentary about outdated models of domestic femininity is instead a black hole of vague analytic nothingness. It doesn’t help that the characters he’s written can’t decide if they’re in a Wes Anderson movie or Charlie and the Chocolate Factory and it shows. 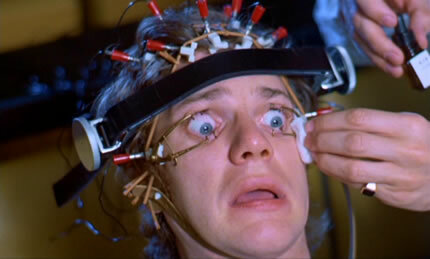 Take Joy’s mother Carrie (Virginia Madsen) for instance, who lies around her bed day in, day out taking in the soaps as if their syndication depends entirely upon her adopting Clockwork Orange-level viewing habits. She’s written like a caricature and performed similarly, stuck wearing hunky, funky glasses and logged into a lazily-constructed romantic subplot that serves nothing but the growing sense of narrative confusion wafting out of Joy like free smells from a Jimmy John’s. Carrie’s mother, and Joy’s grandmother, Mimi (Diane Ladd) is another example of O. Russell’s inability to stick the landing as she narrates the thing (another blatant scripting no-no) and yet, aside from her faint guiding auditory light, we have no sense of who this woman is outside of the fact that she encouraged the young Joy to follow her dreams of inventing nifty things. And herein lies the great problem of Joy; too many characters with ill-defined relationships. This being a film in which decisions are based solely on characters’ relationships to each other, there’s far too many instances where we don’t know why something has occurred and, more importantly, what the chief underlying issue is. See Joy’s relationship to her stepsister Peggy (Elisabeth Röhm) for all the proof you need on that one. Like seriously, unless O. Russell was forced to make major cuts to his script or leave massive slates of celluloid on the cutting floor, there’s nothing that justifies the soaring level of bitter bitchiness that occurs on many occasions. Robert De Niro and Bradley Cooper join the deflated party – presumably because it’s hard to say no to a guy that’s gotten you back-to-back Oscar nominations – as an unlucky-in-love father and a sales executive respectively, and neither role is much to speak of. I would go so far to to say that Rudy Mangano, Joy’s irritating father, is an insufferable character, always misguided in his thought process and yet playing the role of the benevolent arbiter. He irked me to no end, most particularly because O. Russell poorly defines his bipolar relationship with Joy. It’s instead glossed over or forgotten about and we’re left wondering exactly why she ever even lets him step foot in the same room as her. But as the title suggests, this is the story of Joy – not the bulk of supporting characters taking up breathing space – and as the magnanimous caregiver-turned-CEO, Jennifer Lawrence is lights out. Lawrence has this inimitable ability to get under the skin of characters as if by crawling in through their eyelids and her take on Joy Mangano is no different. In a film teeming with underdeveloped characters, Joy feels like a flesh and bone human, teetering on the brink of financial collapse and buckling under the immense pressure that her family is constantly balancing upon her shoulders. Getting back to the Charlie and the Chocolate Factory connection, there are so many bodies crowding the cramped halls of the Mangano household that even Joy’s mostly deadbeat ex-husband (Édgar Ramírez) gets to carve out a spot in the basement. Joy’s golden ticket arrives in the form of her innovative mind and industrious spirit spurred by a serendipitous sailing expedition and highly revered teak wood. Slashing her hands into ribbons wringing out a wine-glass-litered mop, the idea of the self-squeezing Miracle Mop strikes the overworked, underplayed Joy like a bluebird through a windshield. She races to sketch her designs in Crayon, because poverty. But for all of O. Russell’s failures as both a writer and director with Joy, Jennifer Lawrence does her utmost to keep us interested and engaged and in big internal moments of epiphany and tender family moments both, she thrives. She plays Joy with obvious heart that grows and bubbles into strong-willed panache that has her facing off against men trying their utmost to take advantage of her. Seeing that Joy opens with a tribute to all the under-appreciated, hardworking ladies of the world, we enter expecting a feminist through line that only seems to peek its head out occasionally from under all the clutter. Another weird, inexpiable instance of the funky, borderline bad, storytelling that characterizes Joy. 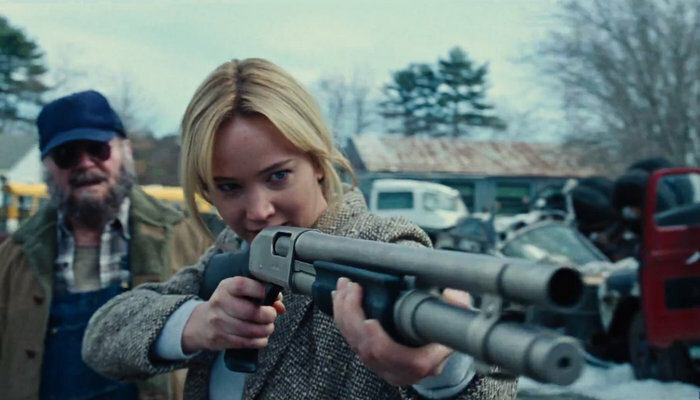 Without Jennifer Lawrence, Joy would be a disaster, as David O. Russell hits a new low point in what was to be his career resurgence. CONCLUSION: ‘Joy’ provides another phenomenal starring vehicle for the uncommonly talented Jennifer Lawrence but, in all other regards, is a cluttered, confused mess. David O. Russell has fallen far from the great heights of his previous endeavors. 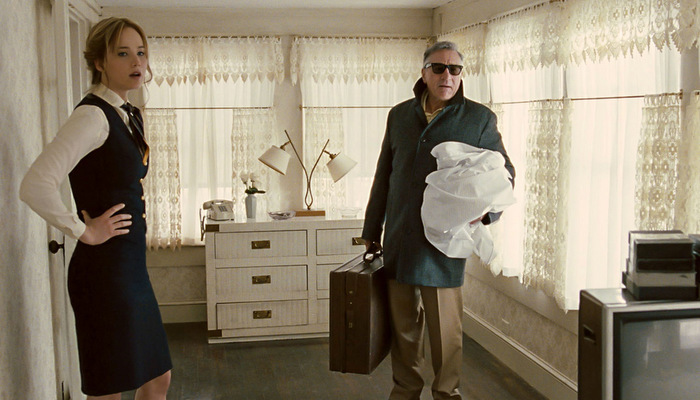 This entry was posted in Out in Theaters and tagged Bradley Cooper, David O. Russell, Diane Ladd, Édgar Ramírez, Elisabeth Röhm, Jennifer Lawrence, Joy, Out in Theaters, Reviews, Robert De Niro, Virginia Madsen. Bookmark the permalink.